1 und – LCD Gráfico com Touch Screen. 1 und – Caneta Plástica. 1 und – Cabo USB. 1 und – CD com software, drivers e exemplos em C, BASIC e Pascal. Documentação impressa, que inclui: Manual EasyPIC7, EasyPIC7 esquemático, mikroProg , e o Guia Rápido para instalar os drivers USB. Este produto é fornecido com versões de demonstração totalmente funcionais dos compiladores mikroC PRO for PIC, mikroBasic PRO for PIC e mikroPascal PRO for PIC. Todas as versões demo inclui uma saída hexadecimal limitada a 2k código. Obs: Módulo MCU Card com PIC18F87J50 USB comercializado separadamente. Produto importado, o prazo de postagem do produto é de 07 a 10 dias e começa a vigorar somente após a confirmação de pagamento pela instituição financeira. 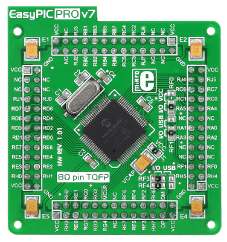 EasyPIC PRO™ v7 is a full-featured development board for high pin-count 8-bit PIC® microntrollers. It contains many on-board modules necessary for development variety of applications, including graphics, Ethernet, USB, Temperature measurement and other. On-board mikroProg™ programmer and debugger supports over 155 PIC® microcontrollers. Board is delivered with MCU socket containing PIC18F87K22 microntroller. 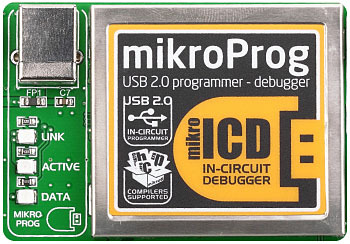 mikroProg™ is a fast USB 2.0 programmer with mikroICD™ hardware In-Circuit Debugger. Smart engineering allows mikroProg™ to support PIC18F, PIC18FJ and PIC18FK devices in a single programmer! It supports over 155 microcontrollers from Microchip. Outstanding performance and easy operation are among it’s top features. The mikroICD™ debugger enables you to execute your program on the host PIC microcontroller and view variable values, Special Function Registers (SFR), RAM, CODE and EEPROM memory along with the code execution on hardware. Whether you are a beginner, or a professional, this powerful tool with convenient set of commands will enable you to track down bugs quickly. mikroICD™ is one of the fastest, and most reliable debugging tools on the market. 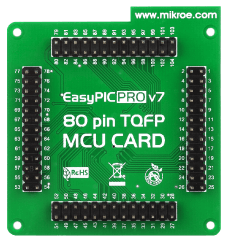 Standard 80-pin MCU card with PIC18F87K22 is included in the package with the board. It’s also sold separately, if you’d like a spare one to integrate into your own hardware or for any other reason. Ethernet connector (RJ-45) allows you to develop ethernet applications. We added additional screw terminals with output 5V and 3.3V power supply. Dual switching power supply allows the board to support boath 3.3V and 5V devices. With three mikroBUS™ sockets you can add dozens of new functionality to your board with minimum hardware adjustments. Collection of mikroBUS™ compatible Click Boards is growing rapidly, and we have designed them with great care, so you donâ€™t have to make any complicated settings. Just plug your board in, and you are good to go.